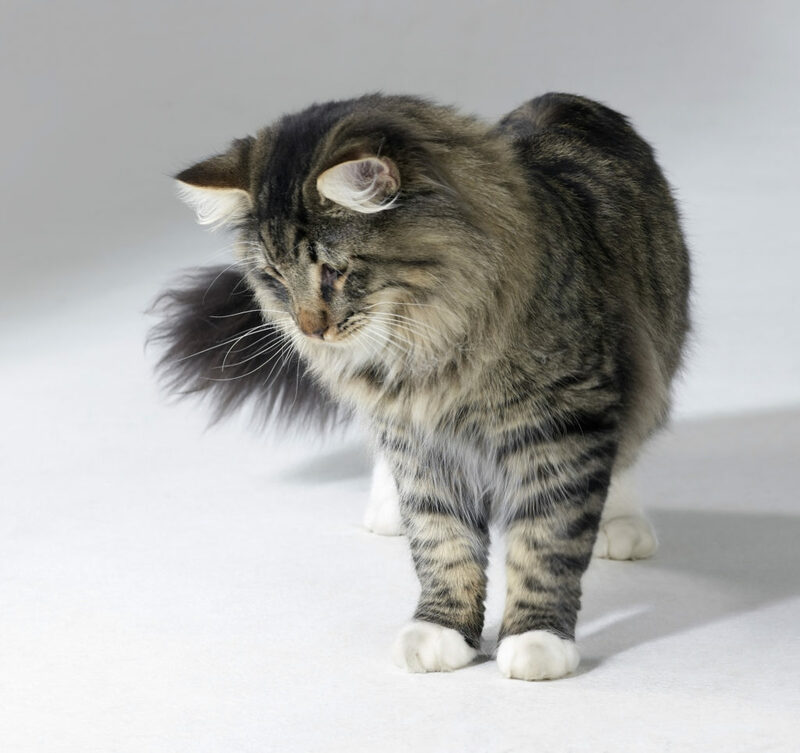 How much should a Norwegian Forest cat weigh? We just adopted one and I was concerned that she was a little skinny at 4.5Kg (10lbs), so I have been feeding her as much as she wants to eat and she has put on 100g in the last three weeks. She seems happy and healthy enough but I was just wondering what other female NFC’s out there typically weigh. 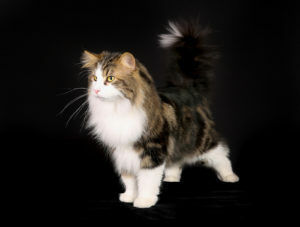 How much should a Norwegian Forest cat weigh? Gabriella Underwood: How old is she?? My boy is 8 months old and approaching 6kg. A local vet will.usually give her the once over for free or minimal.amount. Bentley Jenkins: She’s 6 years old and had a full check over before I got her. My concern is that you could feel her ribs when we got her and for her size I thought maybe 10lbs was a little light. Adeline Boyd: Boys weigh more than girls. A full grown girl can 9- 11 pounds is healthy apprently. Full grown is at 5 years. Adeline Boyd: My boy weighs 6.4 kg at 21 months. My girl of only 9 months weighs 4.1kg. Bentley Jenkins: I agree that 9-11 is probably healthy but given her size I am happy for her to put on a little weight before I start limiting her food intake. Adeline Boyd: Cats are good at measuring there own intake of food. My vet tried to tell me my boy is on the chunky side. I told her she needs to read up on the breed. There is no way he’s chunky. I don’t believe in limiting cat food. Mine have pellets when ever they want. In the eve they get a bit of raw Ox heart. You doing what is best for her, she sounds like she needs more. She will leave when she’s had enough. Bentley Jenkins: Dried food makes her sick, so she has raw fish, beef, chicken etc. Letting her eat as much as she wants feels like good advice given that she only has high quality raw food and that she is an ex breeding cat so deserves a comfy retirement. Adeline Boyd: Oh what a shame she gets sick on dried food. Sounds like you definitely giving what she deserves. Love and good food. Mason Rodgers: The Queen is about 11lbs. She has dry food out always and through out the day she gets wet food as a treat. She’d never eat anything else. She doesn’t like it. Lol, very picky. She’s about 5-6 yrs old. Bentley Jenkins: Handy too because I can pick things up from the reduced section in the supermarket, game casserole and lambs liver, minced up together, seem to be a particular favourite. Amaya Ramirez: Hmm I’d say small, my boy Loki was just over 10lb when we adopted him he’s 4 and the vet said he was ‘very lean’. Adeline Boyd: Boys are in general bigger than the girls. So they will weigh more Amaya Ramirez:. Bentley Jenkins: has a girl so she will be smaller she also was used for breeding and they are in general smaller as they give more to the kittens. But now she is in retirement she will pick up weight and condition well. Serena Craig: My 7,5 kg stud (skinny boy) and his nearly 5 kg queen (she is medium sized). Mother of my stud is big queen about 5,5 kg of muscles and fur. Ana Miller: The difficulty with raw feeding is ensuring the correct proportions of meat, offal, bones etc. Jack Parsons: My boys is just over 12 lbs and just turned 2. I was thinking he was a bit on the light weight side too. He is pretty skinny. I think he might bulk up a bit in the next few years. My other boy, also 2 years old but a mix, is just over 14 pounds. Preston Castillo: My 7 year old female weighs 12.9 lbs; and she’s at a perfect weight. Make sure she doesn’t get “football” shaped in the tummy area. Anaya Sandoval: My boy weighs 18 pounds without fat at 5 years. Never hissed or growled. Indoor/outdoor clay. Bentley Jenkins: Thanks everyone for sharing, sounds like a healthy female is around 11-15 lbs and boys are typically 15-20 lbs.